I love my job. Every day I get to do interesting and creative things. I work on teams with really smart people. For the most part we are self-directed in our work, and I have almost complete discretion over my own daily activities. I’m well compensated for my efforts. The pay and benefits are good, the health care plan is excellent (especially by today’s standards) and the 401(k) match is generous. By any measure, this current employment situation is the most satisfying of my forty years in the workforce. I cannot think of a single thing that I would change if I could. So Friday evening I joined the union. Please allow me to explain. I don’t expect to change things at my company. As I said, there’s really nothing that I’d like to see change there. I have no grievances. In fact, every day I’m thankful for the opportunity to work in such an open and pleasant environment. I didn’t apply for membership in the Industrial Workers of the World to change my workplace. I joined to change the world. The IWW was formed in June of 1905 at the meeting of the Industrial Congress in Chicago. 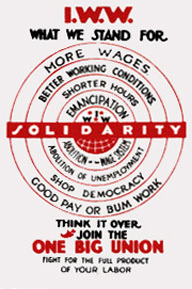 Unlike the trade unions, which participate in structures that often allow one set of workers to be pitted against another, the “Wobblies” (as they are often called) practice solidarity unionism – the idea that workers in all sorts of jobs, in all industries, throughout all the world, share a common cause, and that they should work together towards its ultimate achievement in ONE BIG UNION. The Wobblies have had a sometimes troubled history because of their insistence on staying true to that philosophy. There were schisms (on both the left and the right) in the early years, with the group that remained always holding firm to the ideals of democracy and solidarity above all else. There was also much persecution of the IWW at the hands of business interests and vigilantes, and suppression at the hands of the government. 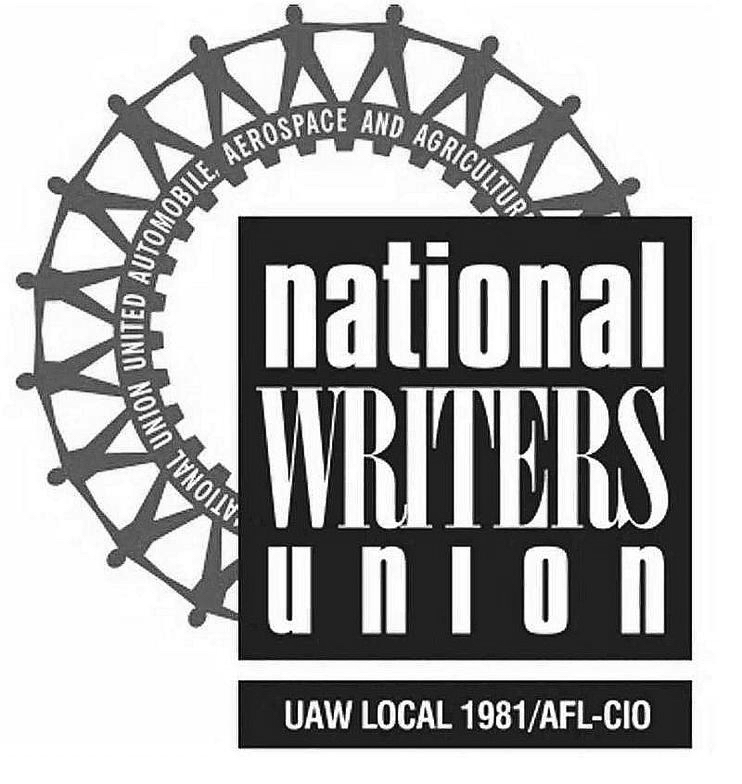 For six years (from March 1947 to April 1953) the union was on the Attorney General’s list of “subversive organizations.” Wobblies were denied federal employment and access to participation in many government programs. Throughout the years, members have been beaten, imprisoned, deported and murdered for having the audacity to work for a more just, free and democratic world. For me, the decision to join the Wobblies was a simple matter of taking a stand. I am 54 years old and I have never held a union card. I have been active in party politics, but, frankly, have seen precious little positive effect on our society from that. I do small things as an individual to help others and to “make the world a better place,” but I have come to believe that individual acts are not enough to mitigate the crises that we face. Our world’s environment is in ruins. Our world’s economy is at the precipice. Violence and war and oppression and injustice are considered to be regrettable but unavoidable facts of life. When I look for the causes of each of these problems, I find one thing always at the root: unfettered capitalism. Perhaps you don’t see that. If not, let’s leave that discussion for another day. In any case, that is the conclusion I have drawn after much observation, study, contemplation and consideration. That being the case, when I look for possible solutions, I find only one: organize with others to work for fundamental change. When I look for those with whom I might organize, I find any number of groups with clean hearts and valid strategies, but only a handful with the depth of commitment and vision that I seek. The Industrial Workers of the World became an obvious choice. Not only did it stand the test of reason, it just felt right. Admittedly, for those looking at the situation through the predominant lenses of our culture, this choice may seem an odd and impractical one. 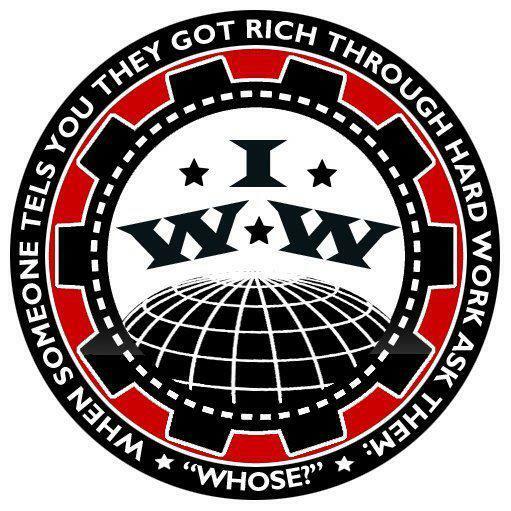 The IWW is small, with maybe ten thousand or so members worldwide. It is an organization that calls for dramatic changes at the very core of our economic structures that are, perhaps to most, unthinkable. It is an organization that has, in some ways, made its objectives more difficult to achieve (over the short term, at least) by dogged insistence on democracy in practice, not just in theory. Can a relatively small, idealistic group of people with a seemingly impossible goal really make a difference? Whether or not the stated goals of the IWW will ever be brought to fruition, I cannot say. I can say that for more than a hundred years, they have been creating practical working models of the world that I would like to see, and they have been ever on the right side of the great moral questions of our age. I have no doubt that standing with them means standing for increased democracy, freedom and justice in our land and our world. I can think of nothing that is of more consequence at this moment in history. I can think of no better legacy that I could choose to leave to my children. I can think of no other purpose that I would prefer to define my life. That is why I joined the Wobblies.